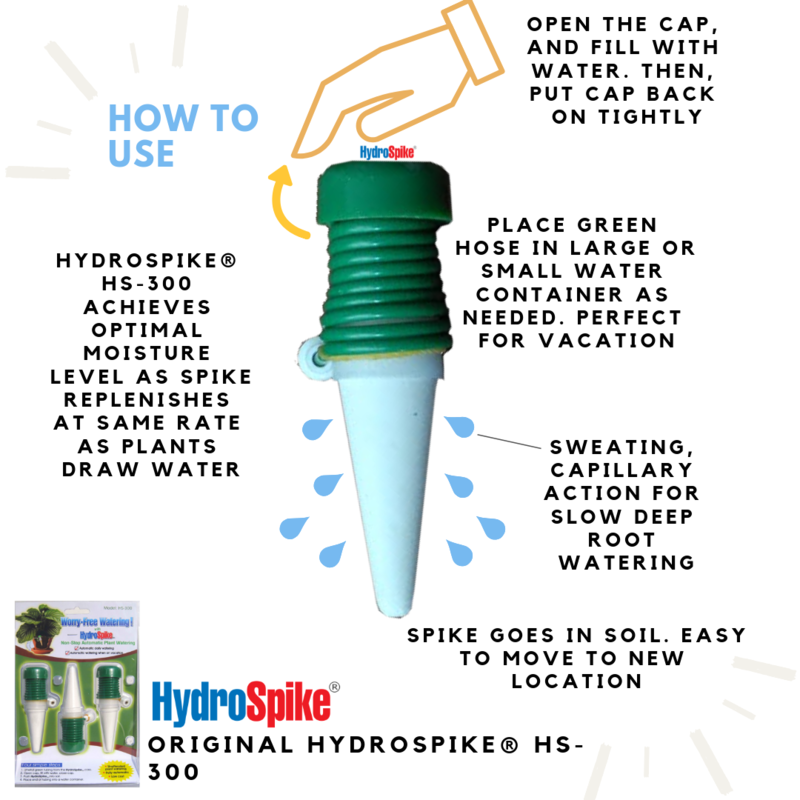 The HydroSpike® Original HS-300 Spikes are the most simple way to water right every time. Our porous, ceramic spike with attached hose is simply designed, easy to use, reliable and long lasting. 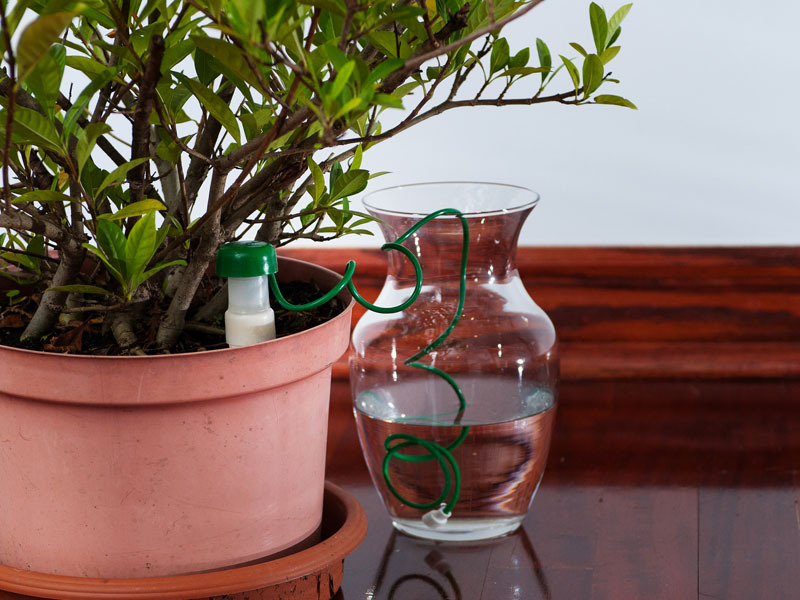 HydroSpike® uses capillary action, a simple scientific principle, naturally drawing water when the soil dries out, watering just when your plant needs. How to use? Fill the cap with water. Insert the spike into the soil of a plant pot. Run the attached small tube to a water reservoir of your choice. Job done! It’s that simple. HydroSpike® waters for weeks at a time if you add enough water in the reservoir. You may even conclude that HydroSpike® does a better watering job than people do! HydroSpike® is designed around the user experience. Our clear cap at the top of the spike shows you the water level. This smart detail (by trusty HydroSpike® only) becomes very pertinent and convenient with use, eliminating any need to uncap and check water levels. Our design updates you on the status straight away. –> Unattended, automatic plant watering. No under-watering, over-watering or worry. –> Ideal solution for “Vacation Plant Watering—and More”™. –> HydroSpike® saves you time and water! –> No more primitive gravity systems that drip like a badly leaking faucet & over-water. –> The HydroSpike® is a proven product. It’s simple yet smart. Try it today! –> Check that you are buying genuine HydroSpike® product by clicking here. How Many HydroSpikes® do I Need? Our guiding philosophy is to look at size of the plant and size of the pot. A little art and science, mixed in with some trial and error will do the trick. Check that you are buying genuine HydroSpike® product by checking here. Typically, we recommend 1 spike for a six inch pot. For a 12 inch pot, we recommend 3 spikes in order for more even watering. 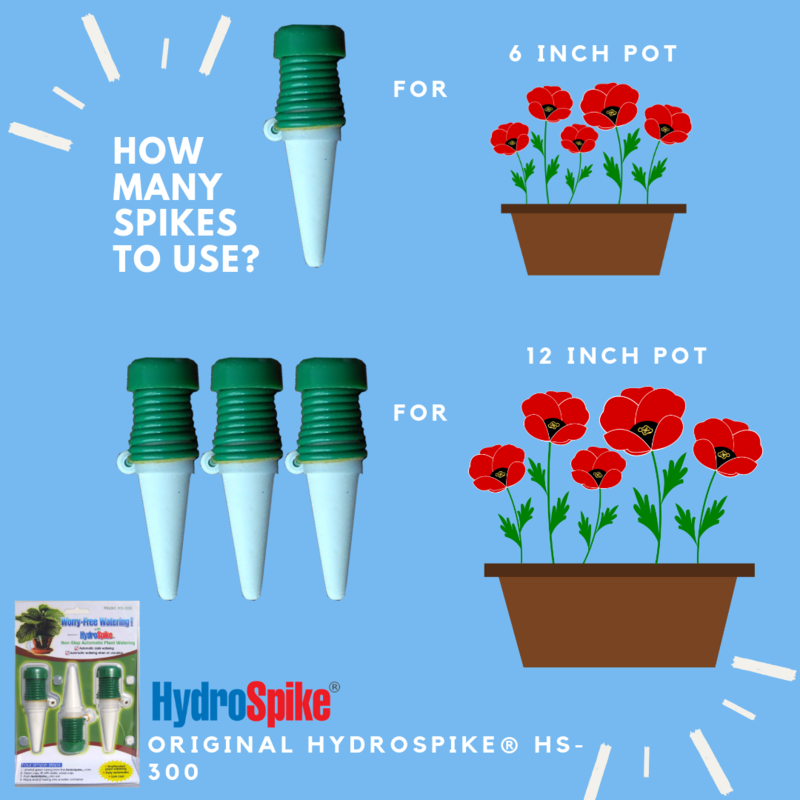 More simplistically, think larger plant = more HydroSpikes®. And if you plan to be away for awhile (e.g., long vacation), you likely will need a larger water container. HydroSpike®, allows you to use whatever size water container you like, which is much more convenient than other watering solutions. HydroSpike® primarily works in soil. Therefore, it is not ideal for orchids, since most orchids are in moss and bark. We mostly do not recommend HydroSpike® for plants that like dry, arid conditions such as a cactus, Joshua Tree, or other desert plants that thrive with little water. It is still possible to use HydroSpike® for such plants, but may take added knowledge and experimentation (we cannot guarantee success in this case; however, if you get it working, tell us and we will recognize you as one of our “advanced users”). Not the best solution for seedling trays. There needs to be adequate room for the spike, soil and roots. If your HydroSpike® system/water reservoir is outdoors, consider using an opaque container instead of clear to slow algae growth that occurs with sunlight. Single drink configuration is one water reservoir for a single HydroSpike® in a single potted plant. Insert the spike into the soil near the root system, and run the watering tube to a single reservoir of appropriate size. Complete instructions here for How to Use HydroSpike®. The reservoir itself can be any type of container, which gives you the freedom to select a container that can be put out of sight or easily camouflaged to keep a clutter free look. Bigger plants will require a larger reservoir and perhaps more HydroSpikes®. 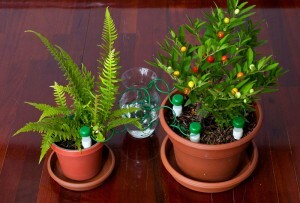 Group drink configuration is one water reservoir for multiple HydroSpikes® in multiple/single potted plant(s). 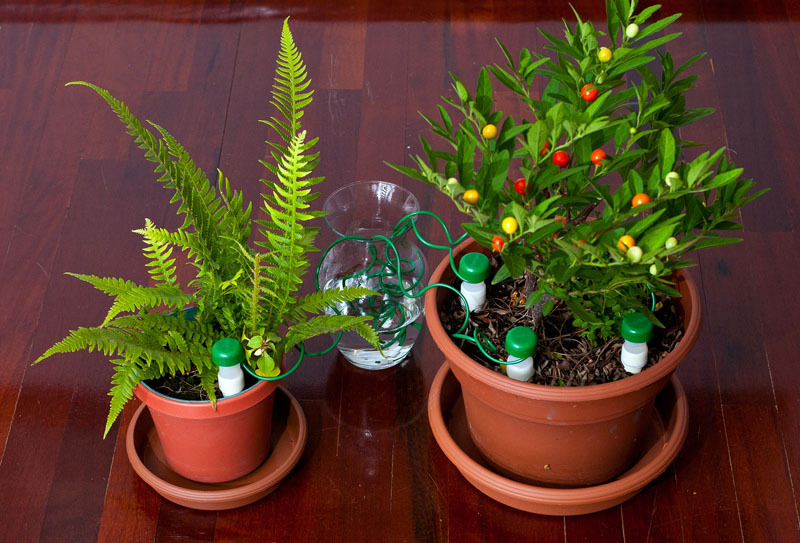 It is possible and desirable to HydroSpike® multiple plants and share the same water hole, all the while nesting the watering container within the grouping of plants. It’s very easy to hide the reservoir for a very clean look. The photo shows how easy it is to run two or more HydroSpikes® into a single reservoir. You also can see how easy it is to hide your reservoir behind the plants or nestled in amongst the foliage. – To straighten the green plastic tubing, wrap it around something in the opposite direction. Or immerse the entire spike with hose in warm water to soften the coils. – Be sure to tightly secure the cap after filling the Spike top with water. The product will not work properly if the cavity inside the cap is dried out and without water. Avoid air pockets by tightly securing the cap. – An important tip: To avoid flooding the pot or saucer plate, keep the water level below the tip of the ceramic Spike, thus not siphoning too much water from the reservoir. – You may decide not to use the HydroSpike® continually with very small pots. But when going on vacation, these may be grouped together and watered from a single reservoir (check out Group Drink). Larger pots, over six inches in diameter, will require more than one HydroSpike®. A little experimentation may be needed to achieve optimum results. For more tips on how to achieve optimum results, refer to Caring for HydroSpikes®. – Monitor performance for a few days prior to leaving the plants unattended. Check to make sure the water level is diminishing. This may be hard to determine with a large reservoir. If so, use a smaller container for checking. 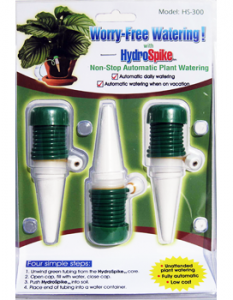 How Long will HydroSpike® Keep my Plant Watered? The answer depends on a few factors. The size of the pot and plant, the size of the reservoir that supplies the water, and how much water your type of plant typically draws, all matter. With HydroSpike®, small and medium plants can stay hydrated for over a month with the right reservoir size, and we even have reports of larger sized plants going for over a month on a single reservoir of appropriate size. The reservoir may be any type of container. The far end of the tubing should extend to the bottom of the reservoir in order to optimally use up the water in the reservoir. Be sure that the tip of the ceramic Spike is above the water level. Refer to General Tips for more information. Caring for (and up-keep to) your things usually prolong their life (health and your body included!). Same thing goes for your HydroSpikes. – The ceramic spike is fragile. Do not drop it on a hard surface, as it will break on strong impact. – If HydroSpike is used only when on vacation, little servicing is required. If HydroSpike is used as an ongoing watering agent, it is a good idea to check out the system every six months or so. The Watering Tube looks Clogged, How Best to Clean it? Due to water impurities, exposure to sunrays and possible other factors, the end of the tubing in the reservoir may experience algae build-up. Forcing air or water through the tubing might unclog or dislodge any growing algae. 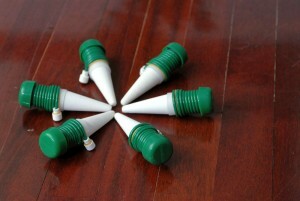 Do this starting from the ceramic spike end and using water is preferable. A cook’s baster or other pump or blower can be used for this purpose. If this fails, run a wire 6” to 12” up the clogged end of the tubing from the spike end to dislodge the algae. Should the ceramic Spike itself appear to be clogged, simply brush out the inside using a child’s size toothbrush. If this corrects the problem, the Spike will begin to “sweat” about five minutes after it is again filled with water. It is also possible that the Spike itself may be damaged and will not disperse water. In this case, submerge the entire unit in water and blow air through the far end of the tubing and a large volume of bubbles emerges, the unit has cracks or holes and needs to be replaced.